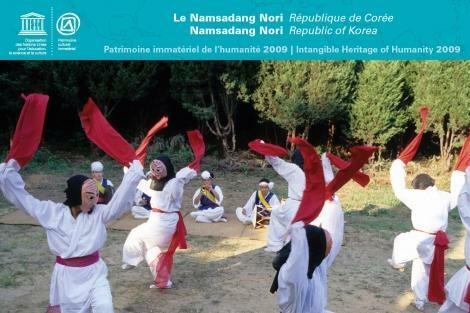 "Namsadang Nori, literally the 'all-male vagabond clown theatre', is a multifaceted folk performance tradition originally practised widely by travelling entertainers and now kept alive by professional troupes in the Republic of Korea. The performance is made up of six components: a segment of 'farmers' music' emphasizes the percussive sounds of metal gongs and animal-hide drums; a mask dance presents four comic scenes depicting people from different social classes; a tightrope walking act sees an acrobat on a high-wire engaged in witty exchanges with a clown below; in a puppet play, more than fifty puppets act out seven scenes together with a narrator and musicians; an acrobatic segment combines physical feats performed on the ground with comic dialogue and music; and an intricate display of hoop spinning with a wooden stick rounds out the performance. In addition to entertaining rural audiences that would surround the performers in outdoor arenas, Namsadang Nori carried an important social message. The mask dance and puppet plays in particular enacted the oppression of the lower classes as well as women in a male-dominated society. Through satire, these performances raised issues on behalf of those with no political voice and manifested ideals of equality and freedom, sustaining and inspiring the poor." Authors and personalities: Kim Kwang-shik-CHA, director. Production: Republic of Korea. Cultural Heritage Administration, sponsor.